Hi Heidi! I love these soaps! and thought they would be great as a gift for Moms! ! I’ve added it to my DIY Projects for Mother’s Day list here: http://www.craftcuts.com/community/home-decor/simple-diy-gifts-mothers-day/ Keep up the great work! This is my first time using a soap base. I made my other soaps using the Cold Process method with lye which takes a lot longer and requires more care. This was great, I did it with my six year old grand daughter. They look great after setting up overnight but are still a bit soft. Should I put them on a rack for a day or so to harden a bit more or will they stay this way? This is a great process by the way! Wow….this is amazing. I just love it. Looking forward to making this. Thanks a lot for sharing. Can the honey be granulated or must it be fresh and smooth? Thank you for sharing this recipe. We will be making these for the homeless grooming kits we give out 4 times a year. We will add an immune boosting essential oil also! Thanks for sharing Heidi. You have gotten quite a bit of feedback. I don’t really follow any blogs aside from my friends mommy blog, but I love crafts and diy gifts so I think I’m going to have to start following you. Question: I have sensitive skin. 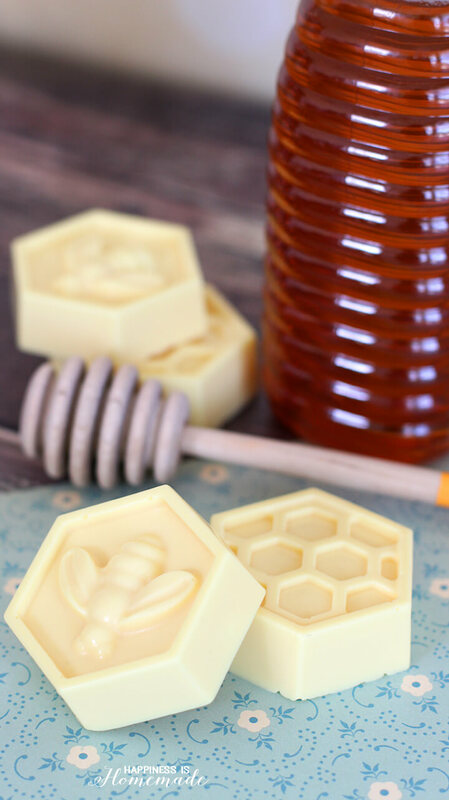 Is the soap base you use okay for sensitive skin/little ones? If not, is there an alternative? Thanks for your time. Happy Fall! I’m really excited to try this! It looks like the perfect homemade gift. I’m just wondering about the scent. Is it a very subtle scent? Do you think it would smell good if I added peach fragrance to it? Would the honey and peach combination smell good? 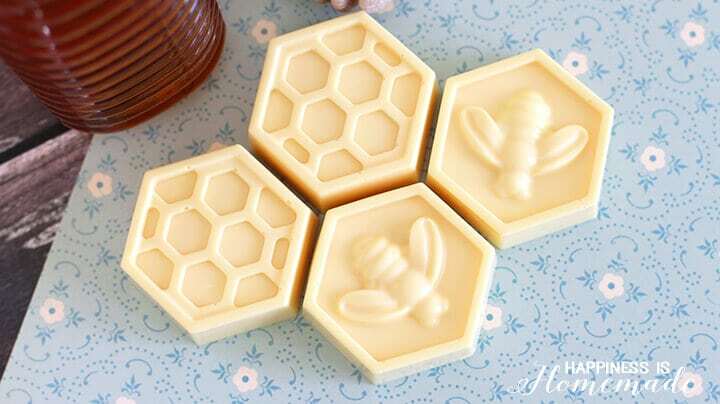 Hi loving the conveinents of these soaps. With the honey does it have to be raw organic or can i jusy use organic honey? Thank you for this! Made a batch last night and then another tonight! So simple and easy for little extra Christmas presents. I think I’ve started a love for a new hobby and look forward to trying more soon! Hi! I made these last night and it is very simple! I was wondering if it’s possible to melt the soap base in a crock pot instead to keep the consistency. I notice the mixture started to clump up mid pouring and I had to reheat a few times. Thanks! I have not tried it myself, Fay, so I can’t say for certain, but I have heard of others who have done this successfully in the crockpot. If you try it, I’d love to know how it turns out! Hi Heidi, thanks for this awesome post. 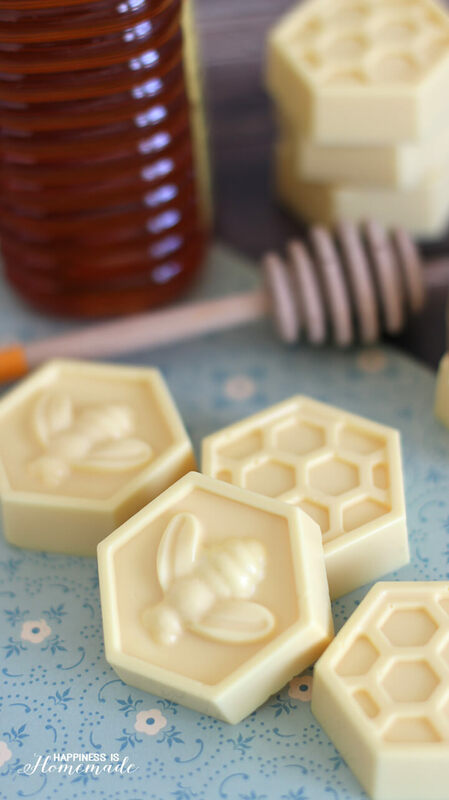 It’s great making soaps like this from home. I intend producing something like this in larger quantities to resell. Do you think there can be demand for it? These are adorable! I am thinking of making these as gifts for my baby shower. 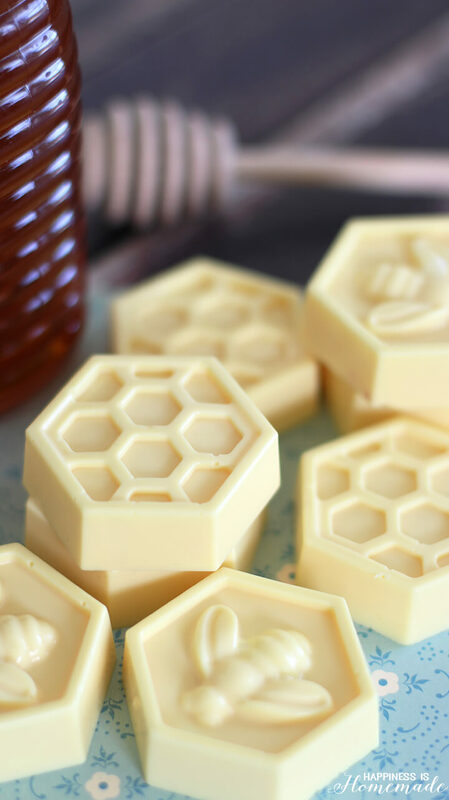 I would like to use this recipe but with snowflake molds. My question is do you think a light blue coloring would work just as well? If I want to gift these to someone is there a specific time frame they should be used within? Like if they keep the extras in their bathroom pantry how long would they last? Hi, I just have a few questions about making soap, I’m a newbie at this???? I can’t get goat milk based soap so I got glycerin base, but there’s glycerin in yours too. My question is, can I just add honey in my base like you do as well? 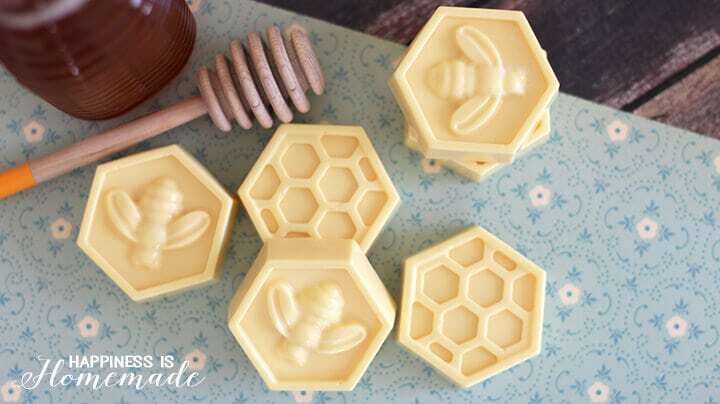 Can’t wait to get started, bought the honeycomb mold, it’s so cute! ???? You can absolutely use glycerin base if you can’t find the goat’s milk base! 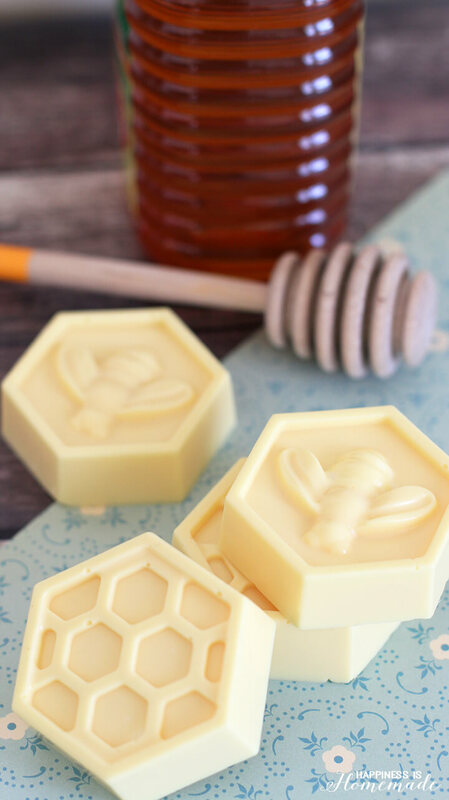 It has a slightly different feel on the skin, but it will still smell lovely and look cute! Best of luck! I made these last night, but I think I did something stupid. I didn’t have any yellow mica, but wanted the color, so I used a little bit of turmeric. That was kinda dumb because I’ve never used turmeric to color soap before, and it left a weird smell. I thought the sweetness of the honey would cover the smell up, but it did not. Can I melt it down again and try to scent it and maybe make it smell better? I have a small variety of essential oils. Thanks! You can absolutely melt it back down, Briana! I’m not sure how strong the turmeric smell is, but I’m sure that adding a fair amount of a strong scented essential oil would probably help cover it. Good luck! Hey, so I don have access to Life of the Party Goatś Milk Suspension Soap, but i do have some regular base grid soaps, white and clear. 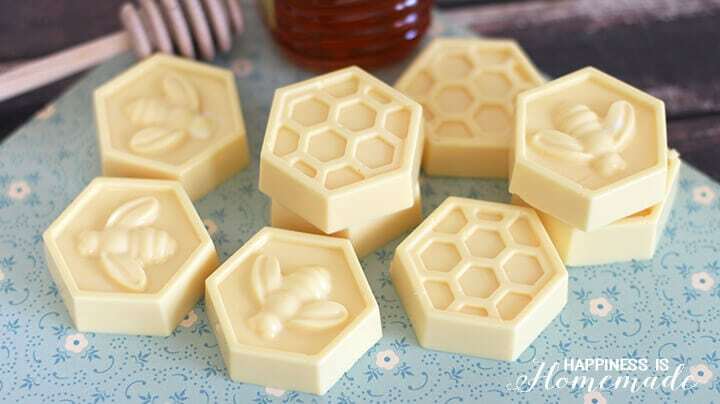 And because of this, I don´t know what ratio of soap to honey i should use. Help haha! 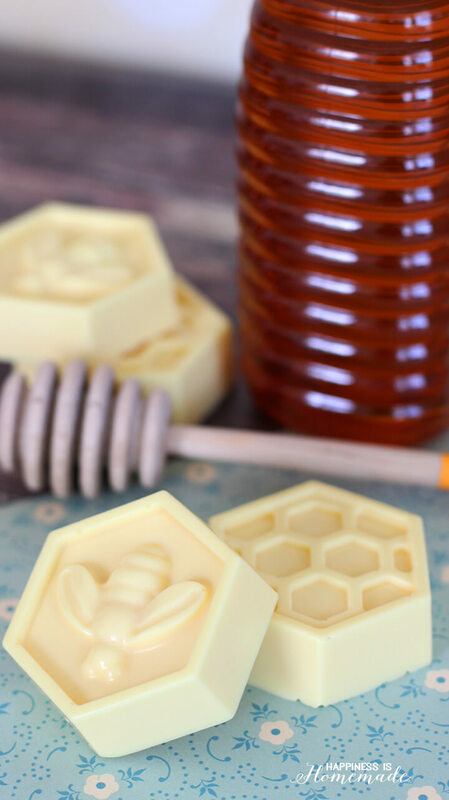 Thank you for sharing this simple, wonderful looking soap recipe! And thank you for making it easy to find the products to make it. Just ordered everything and I am trying it ASAP!